With women and kids, most home sewists know how to measure – chest (or bust for women) waist and hips. 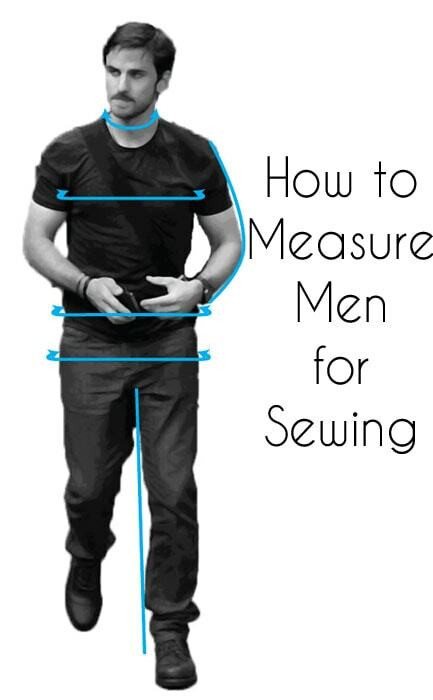 But with men’s sewing and clothing, there are a few more measurements, so today we’re going over how to take mens measurements for sewing. And yes, I enjoy Once Upon a Time, so my drawing for measurements is inspired by that show. Neck – measure around the base of the neck, without holding the tape too tight. This measurement is for dress shirts – you want the collar to be close to the neck, but you don’t want your guy strangled by it. Chest – this is pretty much the same as women and children – measure around the fullest part of the chest. 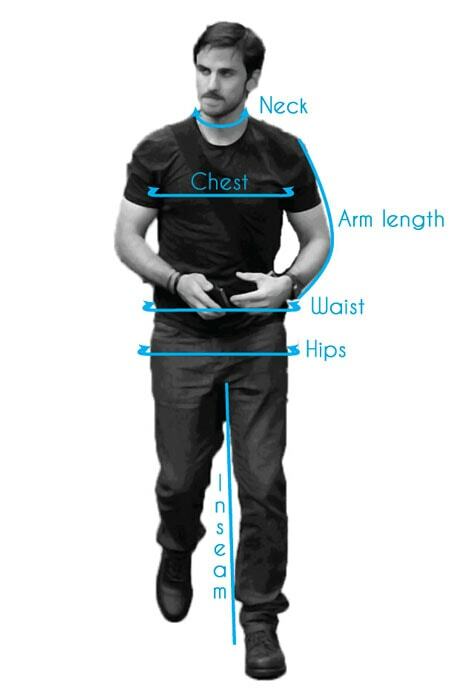 Waist – men pretty much never wear pants at the natural waist anymore – nor is it particularly important to know the measurement of the natural waist (unless you’re sewing historic costumes or something) because they’re most likely not going to be wearing dresses (which are the main reason you need to know the natural waist measurement on kids and women). So measure around 2-3 fingers below the navel – or just where your guy’s waistband hits. Hips – again, about the same as for women and kids – you’re measuring around the fullest part of the hips, which is going to be lower than the actual hipbones. Arm – Like the neck, this is important for dress shirts. Measure from the point of the shoulder to the wrist with the arm slightly bent. Inseam – measure from the top of the inner thigh to the floor. One more measurement that I don’t show here but that you will want for tomorrow’s tutorial is the rise. This is the depth from the top of the thigh to wherever you measured the waistline. lovely thnks melly am grateful..
Hi, I think the torso length is a good one too. My man is fairly long in the body…. I only made that mistake once. what a lovely model 😉 thank you for the information, i really appreciate it!